The Camp Horizons Leadership Camp is a 4-week camp program designed to provide leadership training to rising high school seniors (or the equivalent for international campers). Leadership Camp provides intensive training in a variety of leadership skills relative to an array of educational and professional pursuits, and it also equips potential Camp Horizons’ counselors with the skill set they need to be successful camp leaders. Leadership Campers are asked to assist camp staff in leading camp activities and to eventually take responsibility for designing and implementing a camp activity under the supervision of camp staff. 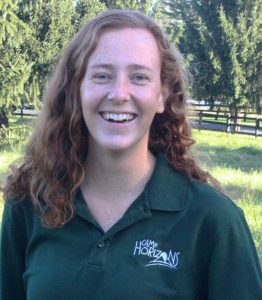 Harriet Flynn earned her degree in Parks and Outdoor Recreation from George Mason University, and has been working in the industry for the past 7 years. 1. Why do you think it’s important for rising seniors to participate in Leadership Camp? Leadership Camp provides rising seniors the opportunity to step up and learn how to be a leader. Throughout high school some students get to have leadership opportunities in clubs, sports, or student government, but often those roles are given to students who appear to be “natural leaders” and lack a mentorship component. Here at camp we believe that every camper has the ability to be a leader and we help them learn what that looks like for them. Every Leadership Camper will leave with more confidence in their public speaking abilities, a greater pride in who they are, and strong bonds with other Leadership Campers (LCs). The Leadership program also looks great on a college application or work resume! 2. Why did you choose to work at a summer camp? I chose to work at summer camp because when I was 16 I did a program similar to Leadership Camp and it changed my life! I loved every second of being an LC, learned a lot about leadership and program planning, and made amazing memories and friends. By the end of my time as an LC I knew that I wanted to work at summer camp forever! 3. What is the best thing about working at Camp Horizons? I love how much fun we get to have, from the activity periods to the large camp games to running around in the rain. Having random unplanned fun is my favorite and the LCs definitely get to have lots of it. 4. What is your favorite part of the Leadership Program? My favorite part of the Leadership Program is getting to watch each LC grow throughout the four weeks and seeing them lead activities and cabin time. I also love our lesson times each day when it is just the LCs and coordinators getting to discuss what is important to each person and learning more about each other. 5. How do you think the Leadership Campers will benefit from this program? LCs will benefit from this program because they will learn different forms of leadership and practically what those look like in different settings. They will learn how to deal with conflict and how to work in a good to reach a common goal. Leadership Campers are selected through a competitive application process and are expected to carry themselves with a high-level of maturity throughout the program. To apply for the Leadership Program, please submit a completed Leadership Program Application. Applications are due by Friday, January 18th. Once completed, please submit your application to Liz Heilbronner, Associate Camp Director, at camp@horizonsva.com for consideration. Applications will be reviewed and all applicants notified the first week of February. Please note that there are limited spots in the Leadership Program. Upon acceptance, you will need to complete the registration form and complete payment prior to June 1st. Please feel free to contact us at 540.896.7600 with any questions you may have. We will follow the typical camp schedule (including free swim time) with the addition of a few offsite trips and different focuses each week.